Last month the worldwide effort to thwart the illegal copying and sales of video games took a turn to the draconian, with a number of publishers introducing new measures that often seemed to impact legitimate gamers as much as pirates. France-based Ubisoft rolled out a new form of digital rights management that require players of their PC games to stay online at all times to play. Japan-based Sony tested out a new system that would require people purchasing one of their Playstation Portable games used to pay an extra $20 to play online. And Nintendo, taking a page from the music industry, levied a $1.5 million dollar suit against an Australian for copying their games. But the companies involved all say the timing was coincidental and that these efforts are just their latest attempts to stop a practice that is hurting everyone from legitimate gamers to developers and publishers. "Nintendo has been battling piracy in all its forms around the world for more than 20 years," said Jodi Daugherty, Nintendo of America's senior director of anti-piracy. "We have anti-piracy programs in more than 40 countries and we take a multifaceted approach to combat it, combining legal enforcement, consumer education, technology innovation and lobbying. I think a number of high-profile enforcement cases recently might have made it seem like there has been a surge, but Nintendo has always been aggressive in fighting piracy." 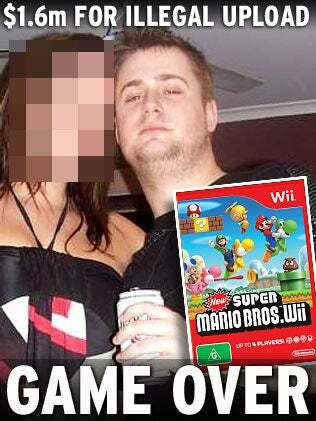 But what is becoming Nintendo's most notorious anti-piracy effort is the case against Queenslander James Burt. Burt, 24, is the first Australian individual to be sued in the country's federal court for game piracy. Burt uploaded a copy of Super Mario Bros. to the Internet and the game was later downloaded more than 50,000 times. In early February, the federal court ordered Burt to pay Nintendo $1.5 million. Daugherty told Kotaku that Nintendo later reached a settlement agreement that has Burt paying a "significant lesser amount." She declined to say how much that amount is. "It is not Nintendo's policy to go after individuals; however, this was not a situation of merely an individual gamer," Daugherty said of the agreement. " Mr. Burt actually was a distributor of illegal software and boasted about being the first to upload New Super Mario Bros. Wii ahead of the global launch date." Ubisoft's latest anti-piracy efforts hope to prevent that sort of thing. In January, the company announced they would be ditching an unpopular third-party digital rights management system for one created in-house. The new system, they said, would require gamers of their PC titles to be online to play the game. While they aren't the only ones to experiment with this form of copy protection, the implementation became a problem for gamers with spotty Internet connections. Apparently, if a gamer loses a connection to the Internet while playing on their own, the player is immediately kicked from the game, losing all of their progress. Ubisoft declined to comment on the loud and seemingly legitimate backlash this decision has spurred. The third big effort to combat piracy that hit in February came in a surprise move from Sony with the launch of their Playstation Portable shooter SOCOM U.S. Navy SEALs Fireteam Bravo 3. The game, which includes a popular online element, comes with a printed voucher code that allows a person to create an account and play the game online. But it only comes with one of these "online entitlement vouchers", so if the game is purchased used, borrowed, rented or the code is lost, or if the game is pirated, a player will have to pay an additional $20 to get a second code. John Koller, Director of Hardware Marketing for Sony Computer Entertainment of America, said the company decided to test out this new anti-piracy system because of the significant impact piracy has had on the Playstation Portable. "There's no doubt that piracy has had a negative impact on PSP software sales," he told Kotaku "It's an issue that affects everyone, from the smallest developer to the largest publisher, and unfortunately impacts honest consumers as well – as it can limit the creative software launches that we've come to expect on the platform. Today's consumers are more tech savvy and better connected to the internet than ever before. While the launch of (download only) PSPgo was a significant step towards the fight against piracy, we're continuing to take aggressive steps to address the issue and minimize its impact on the PSP." He said that Sony decided to test the system now because the company knew it would have a "clear impact" on SOCOM, which has such a strong online community. "We're committed to doing everything in our power to protect the PSP platform and our publishing partner's IPs," he said. "This new initiative is a significant step forward in the fight against piracy and will help ensure that SCEA continues to deliver innovative, cutting-edge software titles to consumers." The system also could have a significant impact on the used sales of the game, something most game publishers aren't very supportive of because they don't get a portion of those sales. But Koller said any impact on used game sales was not deliberate and that the program was "designed strictly with piracy in mind." He added that retailers like GameStop "understand the need to combat piracy, as their revenues are affected as well." And it's possible the Online Entitlement System will get more use. "We are currently exploring the possibilities of including this new feature with additional PSP titles moving forward, but we have no announcements to make on it at this time," Koller said. He didn't say whether the system could one day come to the Playstation 3 as well. People have been copying and stealing creative works almost as long as they have been mass produced. In fact the use of the word pirate to describe someone who copies someone else's work dates back to the 1700s when Daniel Defoe agonized over hand-written, pirated copies of his poems sold on the streets. But in creating new ways to fight piracy, developers and publishers shouldn't, can't ignore the impact those new efforts have on legitimate gamers. In talking with Sony, Nintendo and Microsoft, all three acknowledged the importance of not trampling the rights of legitimate gamers in their pursuit of pirates. But some of these new measures seem to do just that. While the Online Entitlement Voucher system will certainly cut down on people playing the game online illegally, it also makes renting the game seemingly impossible and hikes the true cost of buying it used at GameStop to nearly ten dollars more than the new price. And if it isn't adjusted, Ubisoft's system could also make pirates out of people who would normally never consider the prospect. The fight against piracy may be a war, as the video game industry so often calls it, but that shouldn't make all gamers the enemy.